Govt bidding out national highways for operation and maintenance. hanumadu wrote: GST is causing people's turnover to increase 10 fold. we thought people under report by 1/2 but looks like it is 1/10... WOW! Can informal economy be 10 times our formal economy? Hope this resolves the black money issue and tax revenues zoom up. May be Modi should rein in IT and reduce taxes by 50% to encourage more and more compliance. Can we trust these BJP people to change the tax system and reduce IT harassment? vijayk wrote: we thought people under report by 1/2 but looks like it is 1/10... WOW! Can informal economy be 10 times our formal economy? 1/2, Are saar there are so many who never paid any tax whatsoever. Can you believe India has officially only 31000 or so earning 1Cr+...? IF Modi has to reduce taxes it should be in Indirect taxes, because that will give immediate benefit to all, but much more impact for lower and middle strata. Also reducing direct taxes while keeping high indirect taxes is regressive. I rather like the suggestion given by SSwami, that GOI should remove limit from 80C. Any saving done in prescribed instruments should be given tax free status. That would give incentive to show income without fearing tax. GOI can channel this saving money in funding infrastructure spending. vijayk wrote: Can we trust these BJP people to change the tax system and reduce IT harassment? And those same "BJP People" promised that if you report your GST properly from this tax year they will not look at your previous sales and will not reduce. Yes check it out. They said shouting from roof tops. And unless you were hiding under the stone for past few years., the same "BJP People" have been running a country since last 3 years and brought India from BIMARU comatose ICU stage to a stage where the person is starting to walk. Interesting. You want to go to bank and withdraw money from ATMs and complaining about the ATM facility which should never be free (ATMs do cost to install and operate and service - right?) and instead of getting yourself on a cash-less bandwagon. Why do not you use a RuPay card? Or any other mobile banking? You might pay a little higher initially for your services., but you will know your income and expense flows. For that at least you should get on to the cash-less bandwagon as much as possible. *I did not write that report., infact to my chagrin and to my embarrassment, Morgan stanley is on same platform as mine. **I do challenge people to challenge me on those numbers. Boss! U can attack me, mock me all u want to. I am only well wisher of Modi and BJP. I am trying to defend them everywhere I can. The middle class and trader class needs to be calmed down. If not, Jaitley will hand over the country to traitors from Italy with 10 times revenues. Do you get that? I have been pretty disappointed about accessibility of Rupay et al in the past. Happy to say many sites now have the upi option alongwith netbanking, CC etc. Also for RuPay, I guess main let down was because it was never promoted like VISA/MasterCard promote their cards by doling out discounts, freebies et al. Though they can afford that due to their higher charges on transactions, and RuPay might not be able to sustain such promotion, the end user sees the offers and discounts. It was really the Indian banks which failed in this situation I feel in adopting the system. Had they adopted RuPay in big way by reducing issuing VISA/MasterCard, the whole system would have slowly shifted to RuPay soon. But somehow Indian banks do not seem much enthu about RuPay, despite them being part of the RuPay initiative. But now with UPI GOI can actually even by-pass the whole debit Card payment system. The foreign credit card companies are fighting for a piece of the action from rupay. They have already approached the govt on many occasions. Also they have pressurised the Indian banks to promote their cards and many Indian banks are doing it for obvious reasons. As the popularity and reach of rupay increases, their businesses in India will take a hit. Though, i believe this will change soon since banks are introducing aadhaar based payment system (another NPCI product). Go to bank, place your finger on biometric, and if it matches with uidai, withdraw/deposit money. There is a discussion on LOCAL CIRCLES about government intention to levy an inheritance tax. Please read and participate. jpremnath wrote: People blaming the GHI figures should know that Govt spending on social services including Education and Healthcare as % of budget has been the lowest in last 10 years. Around 5% of budget...this is pathetic. not this hogwash again ! that drop in social sector spending was because the centre's share of the revenue that it spent on such services was directly given to the states to spend. You sir, are making a political point in a thread on economics and the next politically motivated post will attract warnings. I take it back...Feel free to delete the post...I took info from a source which I thought was credible. Two years back I submitted my MC to my psb and requested a RuPay card.... a few days later the envelope arrived, but it had a new MC with my name printed on it. I took it to the bank branch, and requested the manager to cancel it, and issue me a RuPay card. The manager wrote some instruction on my fresh application. Lo and behold, after a few days another new MC arrived bearing my name. This time I told the bank manager sternly that if I do not get my RuPay card then I'll close my account and report the matter to the regional manager. This time RuPay arrived, and I have been using it happily. Initially some places didn't accept RuPay (especially for paying bills), but now it has a much wider acceptance. ... Later I was told that the card issuing office in another metro ignored RuPay requests, and issued MC deliberately. Rahul M wrote: not this hogwash again ! view that this expenditure has fallen under NDA. It has not. This is because the Central govt has given a larger proportion of funds to the states, since it is states who are better able to decide the most optimal use of funds. from any payments system that is cheap or ideally free, India must pursue this path for its economic future. I hope India is wise enough to keep all these american corps....pharma, oil, banksters at bay. So they cant prey on the future wealth of India and Indians. India should push for open source collaborative efforts in all fields..
banking, pharma, it..... is there any chance of a open source desktop software coming out of India? I want to get rid of MSFT from my pcs. MSFT, crApple, poohgle, scAmazon. Only in my dreams I suppose. Retail investors continued to pour money into equity mutual funds through SIPs as monthly collection through such schemes in September touched Rs 5,516 crore. 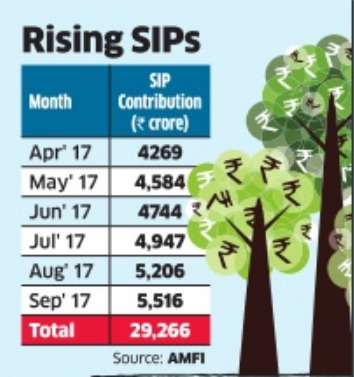 For the first six months of the current year, SIP collections rose 45 per cent, compared with the same period last year, to touch Rs 29,266 crore. "SIPs have become a success due to word-of-mouth publicity from investors. Those who have made money through the ups and downs of the market are now publicising this and they are .. The industry which had 92.31 lakh SIP accounts in May 2016, has registered 1.28 crore accounts by March 2017, and 1.66 crore by September this year. As per data from AMFI, the industry has added 8.8 lakh SIP accounts every month on an average in the first six months of the current year, with an average SIP size of Rs 3,300 per account. The average ticket size per SIP was Rs 2,322 in March 2014, which rose to Rs 3,121 in March 2017. "Investors are shifting from physical savings to financial savings, as many believe equity is no longer a bad word. First-time in vestors prefer to take the equity SIP route to begin their investment journey as they believe that they get services of a professional fund manager," said Satish Menon, executive director at Geojit Securities. Last edited by chetak on 18 Oct 2017 10:05, edited 1 time in total. Kati wrote: There is a vested interest within our banking system to promote visa and MC. I believe that some higer-ups within the banking system are wined and dines by the int'al card cos to promote their cards. True. India is a cash cow for Visa & Mastercard and they would do anything to limit initiatives like UPI/ RuPay etc. our payment system `Made in India'. I have worked with sbi for over a year, and i can certainly say that banks hand out rupay cards in the beginning, unless otherwise requested. But yes, there have been attempts to deal with npci initiatives, including making it a regulatory body with no authority to release their own products in the market. "Inheritance tax?" The fastest way to electoral defeat.What else are the babus in the Fin.Min. thinking of,more ways to squeeze blood out of us? Yesterday a biz friend retailer told me that a small fry gent providing a few home made items for the outlets was in tears over GST as he couldn't increase the price for the outlets afte adding GST which would be too expensive for the consumer and was closing down soon not knowing how he would survive.The babus insulated in their luxe establishments in Lutyens' Delhi simply cannot understand the suffering of the little people of India. The RSS understands this becos. of their grassroot level contacts and membership and have warned the govt.,but who is listening in North Block? Philip, nothing to cry about. Was in a jewellery shop in Kolkata on a recent trip. Customer asked for kaccha bill. Jeweller politely told him no kaccha bill anymore. The system of tax evasion worked with collusion between both seller and buyer. Buyer was not innocent as he/she would like to save a few rupees not paying the tax. With GST this is no more possible as tax has been paid upfront before you buy it. Yes, some businesses operating on the old way will vanish. Price for a more transparent system. Philip wrote: "Inheritance tax?" The fastest way to electoral defeat.What else are the babus in the Fin.Min. thinking of,more ways to squeeze blood out of us? Jaitley/Babus is going to ensure the defeat of Modi. Hope MAD understand what these folks are doing to BJP. VKumar wrote: There is a discussion on LOCAL CIRCLES about government intention to levy an inheritance tax. Please read and participate. Don't use this thread to propagate rumors. Slowdown? GMV of Flipkart, Amazon clock 32% growth. In general, this thread is NOT meant for freewheeling conversations that characterize most threads. You are expected to provide reference data, attributions of claims or any relevant material. If you don't have it, it's better not to post . Most likely your post will be deleted; this thread isn't a casual conversation venue. As RahulM mentioned a little earlier, political posts will be deleted and you'll be warned/banned as well. India's notoriously rigid labour laws are the leading cause behind these anomalies. Labour falls under the concurrent list of the constitution, which implies that both the Centre and the states can form laws on it and neither has been miserly about this. When combined, each state ends up with over 200 different labour laws. These disincentivise firms from growing beyond a point. For instance, the Trade Unions Act of 1926 requires firms with seven or more workers to form trade unions. The Factories Act of 1948 mandates manufacturing units with 10 or more workers to have several working hour limits and workplace conditionalities that become stricter with more workers. As an expansion of firms comes with high legislative costs in India, it is rational for them to remain small. This is why 84 per cent of manufacturing employment is restricted to micro and small enterprises in stark contrast with other developing countries (46 per cent for South Korea and Thailand, 27 per cent for Malaysia and 25 per cent for China). Labour reforms are, therefore, the antidote to India's perpetual job crisis -- but this is a politically sensitive topic. The Modi government is in a unique position of being capable enough of pushing through such bold reforms since it has the numbers needed for this. However, considering how most of its attempts at reform have backfired, this will be the farthest thing on the government's mind. A piecemeal attempt at labour reform with the Small Factories Bill, which aims to exempt factories with 40 workers from 14 labour laws, has been in limbo for the last two years. If there is an inheritance tax it will not affect 99% of the people. It applies to wealth only after a certain limit. Most people would fall out of it. hanumadu wrote: If there is an inheritance tax it will not affect 99% of the people. It applies to wealth only after a certain limit. Most people would fall out of it. But that makes rumor mongers go spread all lies and spread chaos. why now? vijayk wrote: Boss! U can attack me, mock me all u want to. I am only well wisher of Modi and BJP. I think when you mentioned "This BJP People" it got my goat So apologies if I came on too strong. Also from the field I do not see "the seething middle class and trader class anger" as it is made out to be by the #mediapimps. And this "seething middle class and trader class angry people" may vent against Modi and others but when it comes to vote., they will go and vote for Modi. So fear and panic must not drive our analysis of Indian economy and outcome of current major structural reforms*. Nevertheless, Mr Modi still has enormous support. His demonetisation gambit got a remarkable political vindication in March when his party swept to victory in polls in Uttar Pradesh. With a majority in parliament and an economy growing rapidly, this outcome gave the prime minister more wind in his sails. What has he done with all this momentum? Little of consequence. The economic reform agenda seems to have given way to the social agenda promoted by extremist and nationalistic elements of his political party. GoI is tightening quality assurance of consumer goods. This was very long in the tooth and a major reform in its own way. It is basically "execution reform". Consumer goods industry is basically asked to shape up or go home. India’s Fuel Demand Rises 9.9 Per Cent: Fuel demand in India increased 9.9 per cent in September compared with the same month last year. Data from the Petroleum Planning and Analysis Cell of the oil ministry showed that consumption of fuel, a proxy for oil demand, totalled 16.26 million tonnes. Petrol sales were 17.9 per cent higher from a year earlier at 2.14 million tonnes. Cooking gas or liquefied petroleum gas sales increased 4.1 per cent to 1.95 million tonnes, while naphtha sales surged 4.9 per cent to 1.16 million tonnes. Sales of bitumen, used for making roads, were 7.5 per cent up, while fuel oil use edged lower 14.0 per cent in September. Pair the above with electricity consumption growth and one can gauge where the economy is headed. Growth. because of our regressive labour laws, we effectively disincentivize hiring of manpower and push firm owners to adopt capital intensive production methods. couple of years back there was a very insightful article on reforming labour laws by a prof at Jindal University (IIRC) who was also supporter of AAP (go figure !). unfortunately I cant remember his name and cant search for the article. if someone remembers the name of the guy please let me know. he was quite vocal during 2014 for AAP but has faded since. It should be one of the easiest rumours to squash. No body said change will be a cake walk. Vested interests will always oppose it. And this is one change that will affect only the rich, powerful and influential. There will be plenty of falsehoods spread around. So if something needs to be done, it has to be done. And I think inheritance tax is one of the easier things. since anecdotal evidence is all the rage these days. in my south delhi area there has been a sudden spurt in commercial construction in the last couple of months. the pace of construction has been hectic. these are all plots which have had ramshackle residential houses for decades. a nominal inheritance tax of 5% (say) for >25 Cr (or 2500 X National Income) won't be such a bad thing. in UK for example the threshold is less than 8X per capita income and the rate is 40%. Supratik wrote: Philip, nothing to cry about. Was in a jewellery shop in Kolkata on a recent trip. Customer asked for kaccha bill. Jeweller politely told him no kaccha bill anymore. The system of tax evasion worked with collusion between both seller and buyer. Buyer was not innocent as he/she would like to save a few rupees not paying the tax. With GST this is no more possible as tax has been paid upfront before you buy it. Yes, some businesses operating on the old way will vanish. Price for a more transparent system. don't be fooled by this amazing display of lawful business practices which is ONLY for small time customers who spend in the lower double figure lakhs at most. The larger customers, baboo(n)s, politicos, business types spending in double figure crores, those who need to convert ill gotten gains and hide money never get bills. Look guys no charity, forget about business, can survive without paying significant bribes in India. Bribes require black money. Therefore existence requires black money. There will be lots of black money somehow unless bribery is curtailed massively. That requires massive system overhaul of laws, courts, police etc etc. That cannot be even begun without RS majority and some level of accountability for judiciary. I only see steps in right direction. So be patient. With GST this is no longer possible. Even if you buy 10 crore of gold jewellery you have already paid tax at the source. So the seller will loose money if he sells with kaccha bill. I think little bribes.. like policeman catching you for traffic office will never go away easily. But the big ticket items, it will be difficult to hide. The systems are getting stronger and the ways to spend the ill gotten wealth is becoming increasingly difficult. So, black money will reduce! There are many jewellery shops in India with "branches" in the gelf and everyday, thousands upon thousands of very very ordinary people bring in 24 carat gold chains, for example, from those gelf "branches" and give them to the Indian "branches" and get identical 18 or 22 carat chains in return plus the difference in cost. You would easily recognise the names if you heard them. no one one should be so naive as to imagine that all off book transactions have ceased due to GST. GST has somewhat reduced such transactions for sure, but they are still going on, for the right people and for the right price and certainly without bills. What about smuggled stuff?? Don't you read about the tens of kilos of gold bars being seized every day at Indian airports?? for every kilo caught, tens of kilos are allowed to slip through. where do you think that the uncounted tons of smuggled gold end up?? Baboo(n)s and politicos are now demanding payment in gold as bribes. Irrespective of price, gold demand has again increased apart from the seasonal surge in demand on account of festivals and marriages.